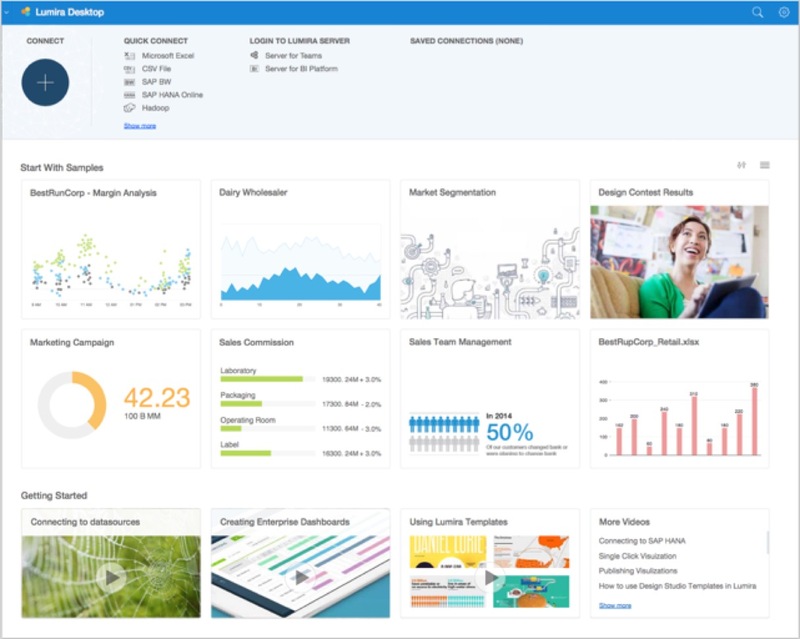 This blog is part of a series of posts by different authors about the launch of SAP BusinessObjects Lumira 2.0, expected to be generally available in July of this year. Previous posts by Ina Felsheim, Iver van der Zand, and Sathish Rajagopal have already provided a great overview of the new functionality available. In this post, I’d like to concentrate on how Lumira can help IT departments address the need for “modern BI” analytics self-service. Traditional BI platforms have long enabling IT departments to provide trusted, interactive analytic content for business leaders. But the time it can take to model the necessary data structures and semantic layers can lead to frustration for business people clamoring for more agile access to data. Given the explosion of new data sources over the last few years, it’s now impractical (if indeed it ever really was) to combine all the data that an organization requires for analytics in a single, centralized data warehouse. The future is about more flexible “Data Management Solutions for Analytics” (DMSA) that combine multiple different types of traditional, big data, and streaming approaches. Thanks to the rapid growth of in-memory systems such as SAP HANA and open-source platforms such as Hadoop/Spark (and SAP Vora), it’s now easier than ever to bring data together for analysis as and when needed, rather than having to create all the data structures in advance. Lumira lets business people access data wherever it is stored — even if it isn’t in company systems. The complex reality of corporate data systems means that there will always be a role for IT-led data integration and data cleansing initiatives. Lumira 2.0 improves access to such trusted data using existing BusinessObjects Universe semantic layers and direct access to data warehouses such as SAP BW. But in addition, it allows business people to mash data together from any source they have access to — from third-party cloud data to local spreadsheets — without having to contact IT. And the solution includes powerful yet easy-to-use features that address the biggest barrier to such self-service data access: the need to merge data from different sources and fix data quality problems on the fly. For many (or even most?) people, nicely-formatted interactive reports and dashboards that give just the data they need to make decisions is still an ideal solution. And surveys indicate that organizations intend to continue increasing their IT-led BI investments. But modern BI is growing even faster. Unlike most operational applications, which typically have relatively long usage cycles before they need to be upgraded, analytics is all about iteration and change. New insights are translated into new business approaches, which in turn require new analytics. In the real world, with limited resources, this has meant that IT departments can never quite keep up with the analytic needs of the business. Self-service analytics has been the mantra of the BI industry since its inception, and one of the primary goals of data warehouses and semantic layers was to enable business people to access data without having to learn computer languages like SQL. But technology limitations restricted what was possible in terms of interactive, user-friendly analysis, and this meant that self-service tended to be restricted to power users. 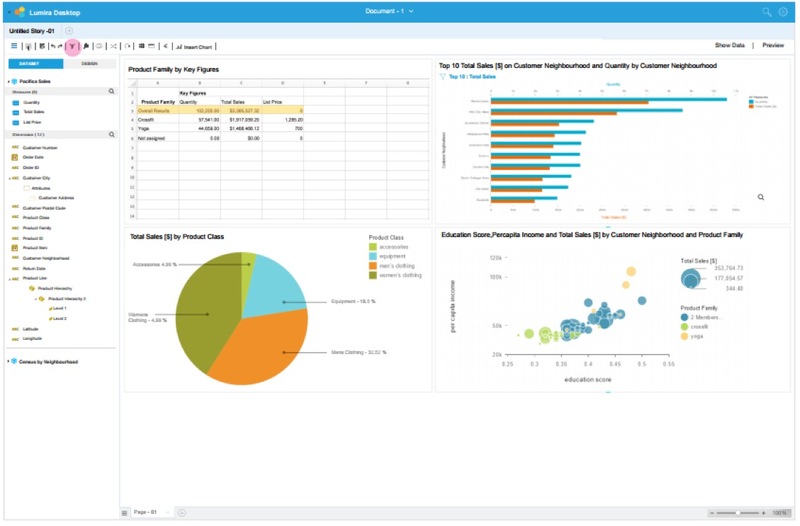 Lumira was built from scratch to use the power of new in-memory approaches that allow business people to do analysis interactively, directly on charts and other visualizations, at the “speed of thought.” This easier, more intuitive approach enables self-service access for a much wider group of users. Screenshots showing Lumira 2.0 planned ease-of-use innovations (note that this is the current state of planning, but may be subject to change). The new Lumira 2.0 represents a big step forward in ease of use. It’s now optimized for less-expert users focusing squarely on the fewest steps needed to get to a useful result. For example, the product opens with a tile view of previously-used visualizations, and users can easily create dynamic dashboards by simply dragging and dropping visualizations onto a new integrated canvas view. And the reworked bookmarking feature makes it easier than ever to share a specific view of the data, while letting recipients continue with their own analysis. To see these features in action, check out the excellent preview demo done by Iver van der Zand. The fear of many IT organizations is that modern BI tools can lead to chaos inside organizations, with business people making bad decisions based on inadequate or misunderstood data. Thankfully, there has been no real indication of this happening. But there have been reports of uncontrolled self-service tool proliferation leading to needless duplication and comparison problems (for example, two different sales divisions might create analyses for the same underlying business problem, but with different approaches). When combined with multiple departments purchasing different incompatible tools, this can lead to high per user costs for modern BI deployments (although this should be contrasted with higher reported business benefits and user satisfaction because of faster development cycles). The ideal, of course, is to have the best of both worlds, combining user freedom with effective IT governance. Lumira 2.0 enables this by being an integral part of existing traditional BI management infrastructures, making it both secure and scalable. Increasingly, IT organizations must take a “trust but verify” approach to analytics. Instead of creating reports themselves and being a gatekeeper, they should enable users to do what they want, but keep tabs on what is being done. With Lumira 2.0, IT organizations can more easily spot duplicated efforts from different groups, and limit the effects of “shiny objects syndrome” — groups using scarce resources to create attractive dashboards that don’t actually align with real business needs. Lumira 2.0 also supports the BI lifecycle, seamlessly combining end-user empowerment with more IT-led approaches. As new BI needs arise, business people can use Lumira Discovery to grab the data they need and experiment with different forms of visualization and analysis, and immediately collaborate and share with others. Sometimes, this will involve one-off projects that never need any IT support. But in other cases, the analysis proves so useful that it should be made more permanent and shared more widely. Lumira Designer allows the analysis to be upgraded and extended to create real analytic applications, complete with links to concrete actions to be taken. Again, Iver van der Zand has an excellent demo to show how it works. This change is going to be really amazing than ever before. Thanks for sharing.